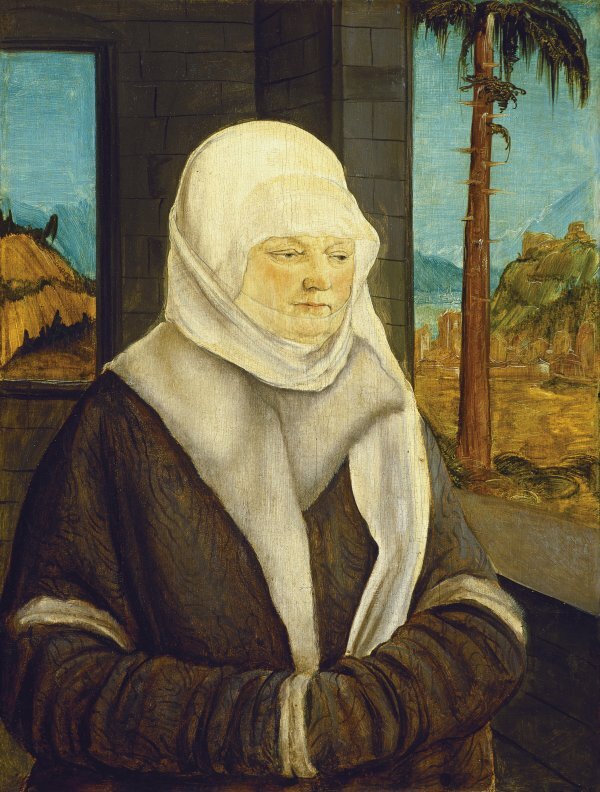 Wolf Huber was born in Feldkirck around 1485 into a family of artists. Stylistically he was associated with the Italianate trends promoted by other German painters such as Dürer and Altdorfer. This panel depicts a woman in half-length wearing a broad wimple. Her realistically depicted face has a pensive expression. She wears plain black clothes trimmed with fur at the neck, elbows and wrists but devoid of decorative elements. Absorbed in her own thoughts, her sleeves conceal her hands, which might have rings on them that could provide a clue as to her identity. Huber locates his sitter in the corner of a room with two windows through which is a view of a bare tree trunk, a city in the mountains and a rocky peak on the left. His crisp depiction of the woman’s features contrasts with the loose, diluted brushstroke used for the landscape. 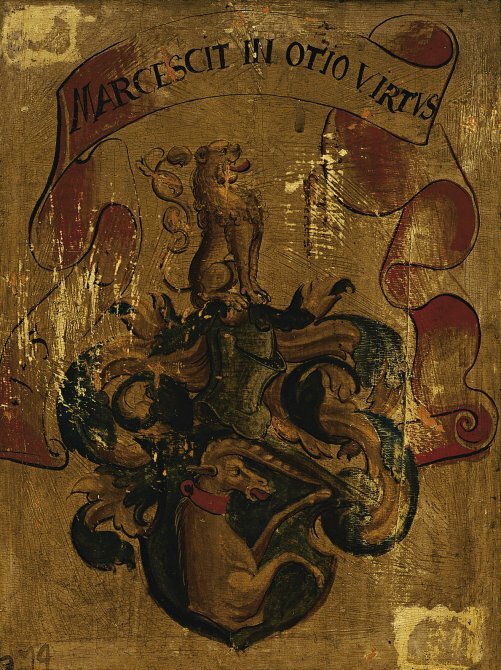 The sitter has been identified as a member of the Reuss family from the coat-of-arms on the back of the panel, which has a motto, a lion and a unicorn with a helm. There is also a date on the reverse that is difficult to read, particularly the last two digits. It has been interpreted as 1524, the supposed date of this painting. The history of this striking, volumetric image, which formerly belonged to Count Edmund Attems, can be traced through the catalogues of the Collection since 1934, the year of its acquisition. First published in 1903 while it was in the Count’s collection in Graz, it was attributed to a member of the Danube School due to the style of the landscape background. It was Friedländer in 1935 who first attributed it to Wolf Huber in response to a request for his opinion from the Villa Favorita, to which he replied in a letter now in the Museum’s archive. This attribution has been universally accepted despite the few portraits known by this artist. Wolf Huber may have trained in the family workshop, although it is also suggested that he made an early study trip (for which no documentary evidence survives) to the Upper Rhine and northern Italy. This would explain the influences and Renaissance innovations evident in his work. Huber locates the sitter in the corner of an interior that opens onto a landscape through two asymmetrical windows. The woman, seen more than half-length, is simply dressed without accessories in a fine coat with broad fur collars and fur trimming on the sleeves. Absorbed in her thoughts, she has her hands concealed, whose rings might have provided additional information on her identity. Huber worked in a limited chromatic range, focusing on the grey and brown tones of the coat, wall and landscape with lighter tones in the face, headdress and fur trimming and the most saturated tones in the exterior view. He outlined the forms of the face and used a loose, diluted brushstroke for the graphic landscape in the background. 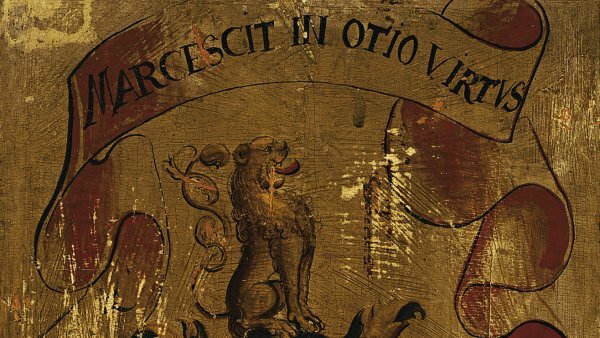 The panel has a coat-of-arms on the reverse that has been identified as that of the Reuss family: a unicorn crowned with a helmet and a lion surrounded by foliate motifs. Around it is a scroll with a Latin motto that translates as “Idleness withers virtue” and a date whose last numbers are difficult to read. The portrait has been compared with another two painted by the artist in 1526: that of Anton Hundertpfund in the National Gallery of Ireland, Dublin, and that of his wife in the John G. Johnson Collection in Philadelphia. Both figures have a background of a wall similar to the present panel but with the sky behind it rather than a landscape. 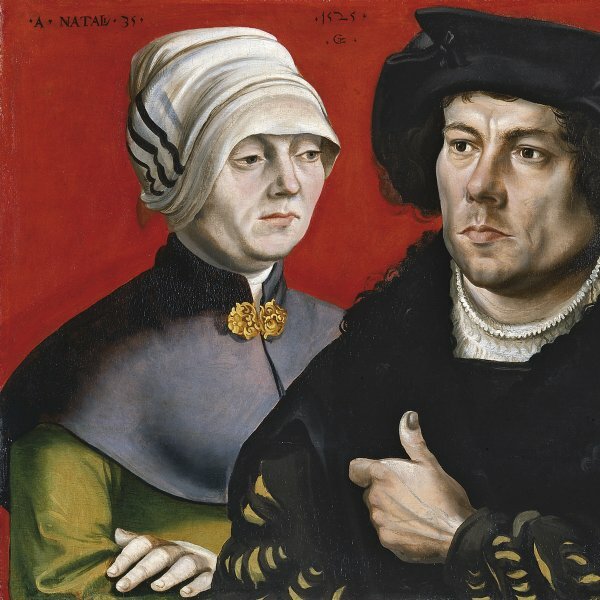 It has been thought that this panel may have been painted as an individual portrait or perhaps as the left wing of a diptych, although in that case, as Lübbeke noted, the woman would have occupied the place of honour normally assigned to the husband. If it were a diptych the coat-of-arms on the reverse would have been visible when the wing was closed.